Last year’s challenge was a bit of a damp squib insofar as I didn’t get anywhere near cooking all the recipes in Delicious Days. I think it’s just not feasible for me to plan cooking to that extent. But crazily enough I have decided to set myself another challenge that I hope will be more achievable. I’ve got a little bit bored with Taste and Create and have stopped doing it. But during the 15 months I was doing it, I managed to cook a partner’s recipe once a month. So how difficult can it be to cook a Challenge menu every month? The theme: vintage feasts. Among my large collection of cookbooks I have quite a few that are over 25 years old, and some that are older than I am. So I’ve decided that every month I’ll pick one of these books and cook a complete meal from it. Most of these will be British food. I’m not going to give a list in advance because I’ll just pick up whichever book I fancy. And that way there is an element of surprise! 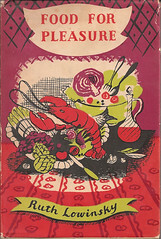 Food for Pleasure is … a cooking anthology whose recipes have stood the test of time, of taste, and of rationing … Mrs Lowinsky, who is herself a cook of brilliance and resource, makes all these dishes in her own kitchen and can vouch for both their deliciousness and their practicality to-day. Yep, rationing was still in force in Britain in 1950! This evidently presented a challenge if you wanted to give a refined dinner party, so watch this space to see how Ruth Lowinsky coped with it. I love that front cover picture. It takes me right back! It’s lovely, isn’t it? The whole thing — design, recipes, style — is a true period piece! Apparently it was one of Elizabeth David’s favourite cookbooks. I can’t wait to hear what you cooked! Although we might snigger a little at the intro, cooks were brilliantly inventive at that time – it is alleged (although I haven’t really got any empirical evidence!) that the crumble was invented during the Second World War (possibly by Marguerite Patten) as a way of making a pastry-type topping but with much smaller quantities than a pastry would need. And now, it is one of our most established and treasured national dishes. By the way, talking about dishes that haven’t been around that long but ‘seem’ to be part of our national psyche, apparantly the Ploughman’s Lunch was invested by the Milk Marketing Board in the 1960s!